There are few things I do better then eating and making snacks. I often am asked for recipes for the many things I bake and share. In the past, I would make 10-20 birthday cakes a year for birthdays in my research group at UNH. Over the years I have developed some pretty good cake baking practices and favorite recipes. Since it is the season of holiday baking, I thought I’d share some of my 3D cake baking experience while make you drool over the yummy cake photos. The photos in this post are all from a practice cake, made in preparation for one I will make on the 24th that I will bring as my contribution to the big family gathering on xmas day. 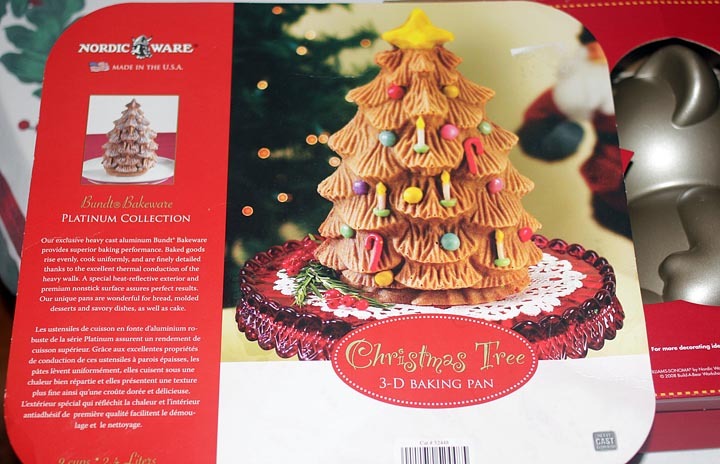 Last year I received this glorious 3D Christmas tree cake pan from my good friends Amanda and Ben. A super awesome gift for me, Thanks guys! When using one of these 3d cake pans, it’s best to make a practice cake to get the volume of batter needed and baking times just right. Speaking of cake batter, lets talk about what makes for a good 3d Cake recipe. Here’s my recipe that I’ve used in about 6 different pans. It’s an alteration from some original recipe that came with one of the pans I believe. Many people think baking is about the recipe, but it is not really. Making tasty snacks is more about the ingredients and some rules on how you combine them then the recipe propper. Cake flour is key for baking cakes. Flour comes in different grades, each with a different content of gluten. In terms of softest (least gluten) to hardest (most gluten) it goes: cake flour, pastry flour, general purpose, bread flour. For cakes, use cake flour. I prefer King Arthurs unbleached cake flour personally but in a pinch I’ll use Pillsbury’s Softasilk cake flour. Different flours taste differently. Experiment and fun one you think tastes best. Be sure to use unsalted butter and not salted in a cake, it makes a difference. Another secret to making exceptional baked goods, is to make your own Vanilla extract. I’ll do a post on making your own Vanilla in the future as I am almost out of my last batch. The short version is buy real vanilla beans and soak them in Vodka. Soften the butter by letting it out in your mixing bowl. Don’t cheat by microwaving the butter, it unevenly melts the butter and it won’t cream well. Let all your ingredients sit out to reach room temperature while the butter softens. Cream the sugar by adding the sugar to the butter and mixing on medium speed until smooth and a bit fluffy. Crack and lightly beat with a fork your eggs until they are just barely mixed. Do not over beat them! You only want to mix them to uniformity. Add the mixed eggs a little bit at a time to the mixing creamed sugar. Stop a couple times to scrape down the sides of the bowl so it all mixes nicely. The flour, salt, baking powder should all be dry mixed in a separate bowl. Sift if you feel the need, I do not. I have done side by side recipe comparison and find sifting of modern dry ingredients purposeless based on the results. Likewise add and stir in the vanilla to the milk in a separate container. Add in alternating fashion, flour, milk, flour, milk, four, milk, flour. Now you want to be careful to not over mix your cake batter. I stop as soon as it’s uniformly mixed. Your cake batter is done and ready to go in the pan. Preheat your oven at 325F and move a rack towards the middle most level. 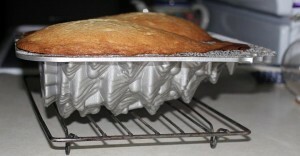 Prep the 3D cake pan by spraying with cooking release spray, and flouring lightly. 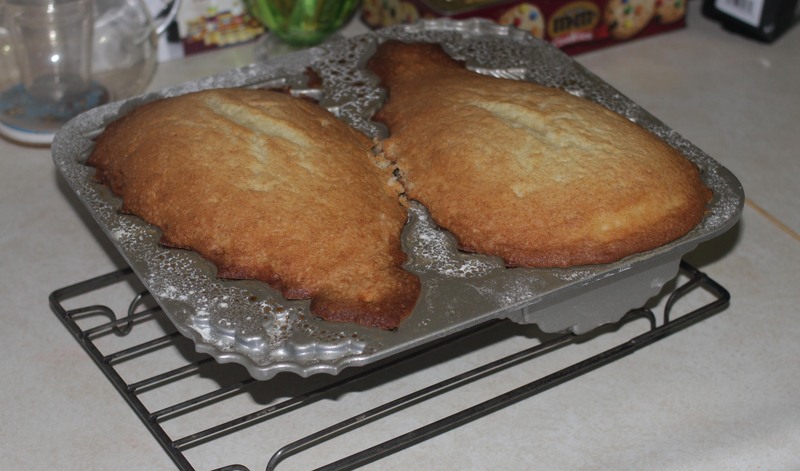 Alternatively you can melt shortening or use corn/conola oil brushed onto the pan and then flour lightly. Cooking spray does a better job of evenly coating the pan and results in better release and details. With some 3D cake pans, my practice cake pan included, you have to pour in a small amount of batter and brush it around the small detail areas. If you just pour in the batter en mass you end up trapping air bubbles causing the cake pan details to be lost to voids. 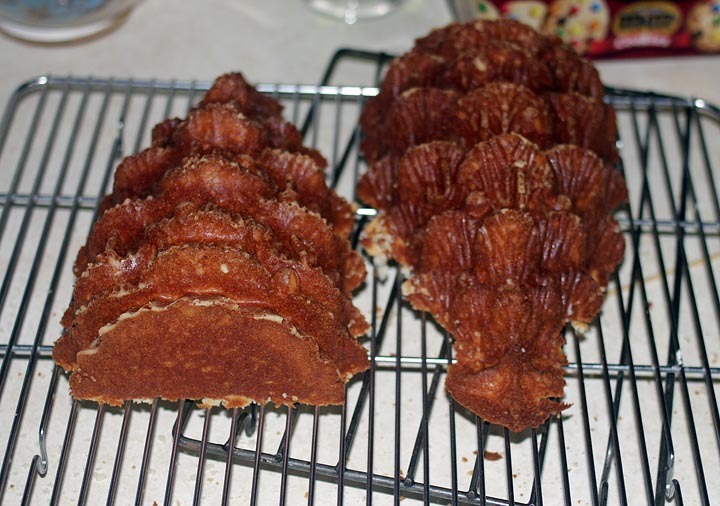 Practice cakes are important for fine tuning the filling process. The recipe above makes enough cake to fill even the largest of my 3D cake pans. I adjust the volume needed for each pan by removing cup cakes from the mixing bowl based on my practice cake experience. 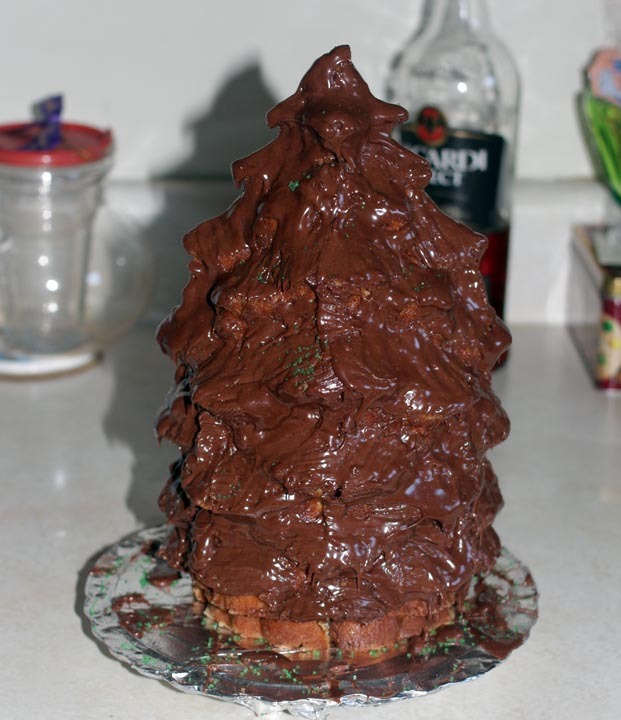 For the Christmas Tree Cake I learned that I need to remove 3 full sized cupcakes prior to filling the pans in the future. 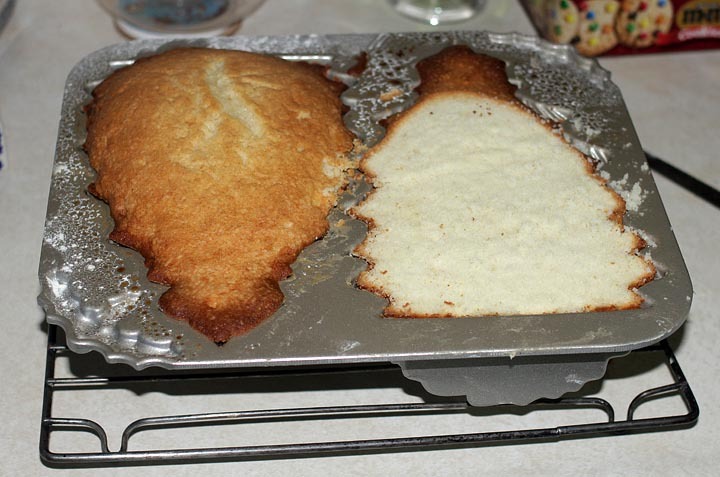 What happens during the practice cake is that you end up with an uneven cake, as seen in the photos below. Fear not, you simply cut off the “muffin top” portion of the cake should this happen. This overfilling leads to the thinner outer regions of the cake being over cooked. Carefully monitor the cake, using 35-45 minutes as a starting point. Every 3d cake pan cooks differently, some longer and some shorter making it important to monitor the time on the practice cake so you can get it just right when you make the real cake. With the cupcakes removed from the full batch of batter, remember that the “real” cake will be done a few minutes early and set your timer 5 minutes before your practice cake was done. Start careful monitoring when your timer goes off so you can remove your cake as soon as it is ready. Nothing worse then an overcooked dry cake. I use long thin skewers to test the center or thickest portion of the cake. When the skewer comes out dry I pull the cake from the oven. Cool your cake in the pan for 15-20 minutes on a rack before you do anything to it. Then trim off the top with a long flat serrated bread knife. Be careful not to nick you precious pan. The nonstick coating is fragile. You can see one side trimmed down in the upper left photo. The bonus is that you get to taste your practice cake at this point. It is hard to beat cake warm from the oven for yummy in the tummy happiness. After you trim down your cake, give it a few taps on the counter to release it a bit. 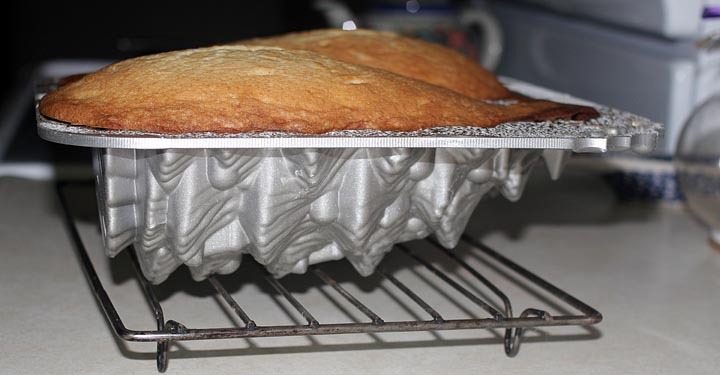 Hold a wire cooling rack over the top and quickly flip your cake. There’s a trick to flipping and releasing the cake from the pan that comes with doing it a few time. Don’t be sad if you fail the first time or two and damage the cake. Just use some frosting to hold it together should this occur. Let the cake cool completely on the pan. This is important, rushing to put it together results in the cake falling apart. Trust me on this one and don’t rush it. 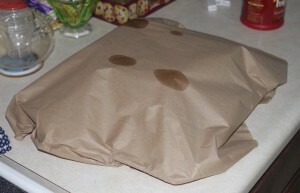 I keep a roll of kraft paper on hand to cover the cake so it doesn’t dry out too much. I then leave it for 3hrs or more to cool. Frost one half of your cake on the flat side with your favorite frosting. 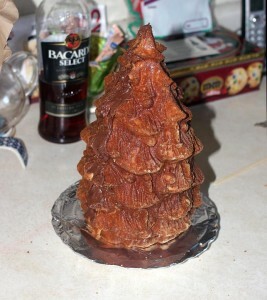 Also frost the base and very gently stick it on a cake wheel vertically. I lightly frost the second half as well, but if your cake is really flat you only need to do one side. Put the second half together and squish a little bit so the frosting oozes out the crack. Then take a small butter knife and trim/putty in the frosting to smooth out the crack. Now it’s time to decorate your cake. I chose a chocolate glaze to go with the practice cake but I’ll likely do a white frosting or glaze with green sugar for the real deal. I wasn’t fast enough with the green sugar on the chocolate and it did not stick as the glaze had cooled too much. Worry not, the practice cake did not go to waste. It was eaten by my niece and nephew. I of course had my fair share of it too. The taste was pretty good, minus the overcooked thin sections that were, well, overcooked and dry. That’s the basics of making a 3D cake. There is no substitute for experience, so make a practice cake or two for yourself before making one to bring to a party or event.